Blog | February 2019 | Valentine’s Day Treats Roundup! This Valentine's Day, show that special someone how you feel with one of these romantic recipes. Whether you want to surprise your loved one with an edible gift or you just want to share a sweet treat with friends, these recipes are sure to impress! Chocolate and Valentine’s day go hand in hand, decadent, indulgent and luxurious. This chocolate olive oil and almond cake covers all bases and will leave anyone who eats it feeling lucky in love! Perfect for even the most ardent of chocoholics, this dreamy cake is the perfect way to say ‘I love you’. Why not try this twist on a classic treat? 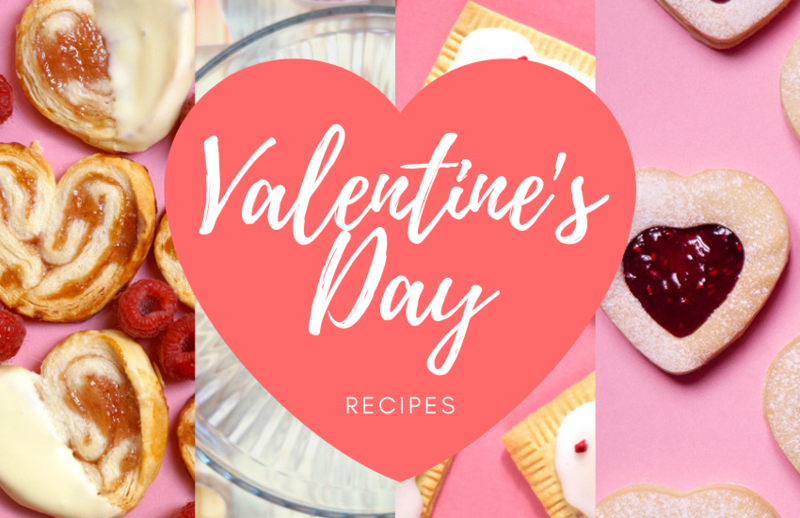 Everybody loves a sweet, sugary snack, so what better way to show your love this Valentine's Day than with delicious Homemade Pop Tarts? They are super easy to make and you can even personalise the flavours with your sweet-tarts favourite jam! Small gestures make the biggest impressions on Valentine's Day. Send lots of love to that special someone with our delectable Heart Shaped Jammies. Bake a batch of these heart-shaped biscuits in no time at all to show you care! These crisp, flaky, buttery pastry Palmiers sound rather fancy, but they're surprisingly simple to make. We've put a little twist on the traditional rolled technique and folded the Palmiers to give them a heart shape for a home-baked Valentine’s Day gift or snack. If your Valentine has less of a sweet tooth why not go for a savoury filling? Grated cheese, chopped nuts and even caramelised onion jam are delicious. So, if the way to your true love's heart happens to be through their stomach, why not say 'I love you' with an edible gift this Valentine's day? We LOVE all of these - and we’d love to see how you use Elle’s recipes too, so don’t forget to share your makes in the Inspiration area and to #Trimcraft when uploading to social media! You can also find Elle on Instagram, so why not give her a follow to see more wonderful bakes?